The killing of the Jordanian Judge, Raed Zeiter, at a border checkpoint, calls for a criminal investigation, but are the wrongs in checkpoint practices a ploy to weaken Palestinian society? The swift statement of ‘regret’ by the Israeli Prime Minister, Benjamin Netanyahu, following the border checkpoint tragedy, was a rare break-off from Israeli military lines, denouncing Zeiter as a ‘terrorist’. In reality, it showed the extent of Israel’s diplomacy with Jordan. The gunning down of Zeiter, is a familiar action to Palestinians. But, it masks a glaring question. If Zeiter wasn’t a citizen of Jordan, would the Israel be quick to release a statement, conflicting military reports of a ‘hit was identified’, or would Zeiter be a forgotten anomaly, prevalent in such cases? Passing a road checkpoint is usually routine. But, in Gaza and the West Bank, it’s fraught with tension that puts an unbearable strain on Palestinian life. By February 2014, according to B’Tselem, The Israeli Information Center for Human Rights, there were 99 checkpoints in the West Bank, making access into towns and cities a distressing ordeal. Heavily armed Israeli soldiers in many checkpoints imprints a weakened psychological condition on Palestinian lives, reaching to the collective consciousness of a people, as communities are split, throughout the region. 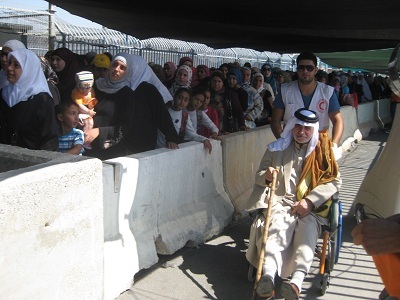 The Israeli military use such vulnerabilities, in its deplorable tactics at checkpoints. These include, detention, for very long hours, often without food or water, verbal or physical abuse, such as stripping semi-naked or being slapped, punched or kicked, to being shot, and, in some cases, killed. Reading news reports of Raed Zeiter, an image caught my eye, which struck a chord. It was an image of hundreds of Palestinian students at Birzeit University, Ramallah, West Bank, holding placards of a young boy, Saji Sayal Darwish, who was shot in the head by Israeli soldiers, in an unrelated incident. The University recaptured my visit there, with affection, many years ago. My journey began horribly. I waited for 8 hours in Israel’s Ben Gurion Airport, while security repeated the same tiresome questions and denied my request for food. Bizarre antics ensured. Immigration seized my mobile phone then later, returned it. Again, my phone was taken away, then given back. (Not fun at all). Eventually, I was free to go. It was now past midnight. I reached my hotel, drained by the unsettling experience. I entered my room and was drawn to the intense light from the window and looked out. I was suddenly at peace. The sight of Qubbat Al-Sakhra, (The Dome of the Rock) was overwhelming. I realized the whole episode was tiny compared to the difficulties endured by the Palestinians, especially at checkpoints – the waiting, the uncertainty. I had a shining light to affirm the worst was over. The Palestinians don’t even have that. – Ridwan Sheikh is a freelance journalist, based in London; a post graduate in journalism from London Scholl of journalism. He contributed this article to PalestineChronicle.com. Contact him at: ridwan.sheikh@gmail.com. Ridwan Sheikh: The behaviour patterns of Zionist “Israel” are exact to what the Jews had accused the Nazis of – or so we are lead to believe from the mouths of “victims of the holocaust” and also from “holocaust” documentaries & Steven Speilberg movies of same “holocaust”. So either the jews are now practising learned Nazi tactics of past atrocities or is this satanic behaviour innate to particular evil persons? The Israeli checkpoints are as obnoxious as the Warsaw ghettos. At the same time, the number of holocaust survivors continues to increase; from whence? @ Nadejda Letat: Thanks for the comment to my article. For political power to flourish, the Jewish narrative is aligned to Zionism in governance. In this context, Palestinians are void of any equal rights alongside Israeli Jews. This is enshrined in Israeli legislation. It’s not enough to blame Zionism, Israeli Jews are content to support Zionism, as it’s the fear-mongering of a delusional understanding of Palestinians taking over, which keeps Israel in Zionist’s control. People are not born evil, it is the development of educating minds that harbours this hatred. From schools to Israeli media, it’s a deliberate ploy to desensitize Israeli Jews of the reality in occupied Palestine.